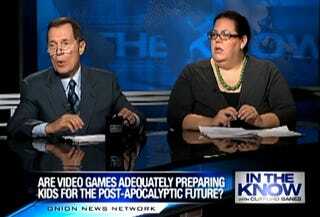 The Onion Asks: Are Violent Video Games Adequately Preparing Our Kids For The Apocalypse? Video games can be beneficial. They better our children's hand-eye coordination, spatial relationship understanding and teach the basics of strategy. But are they doing enough to prepare them for a nuclear future and zombie infestations? The Onion's "In The Know" program touches on this extremely topical debate, questioning whether our violent video game-playing youth are going to enter a post-apocalyptic world with the necessary preparedness to dispatch zombies as well as Chris Redfield or fend off cybernetic mutant attacks as easily in the virtual world. Sure, they may know how to swallow a vial of pills to protect themselves from falling victim to the undead in a simulation, but in the inevitable armageddon? Good points all around here, including some good insight into basic survival needs missing from many current games. Food for thought. Concerned parents should definitely pay attention.